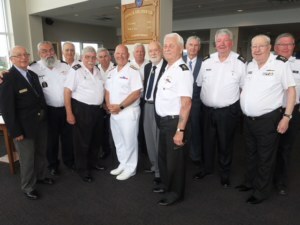 A team of 12 representing the Friends of HMCS HAIDA and the Burlington-Oakville Naval Veterans Association visiting Halifax attended the Tattoo with Trust Directors Pat Jessup and Jim Reddy, and the CNMT AGM reception on the 28th of June, which was held on the “Bridge” on the 12th floor of Juno Tower. 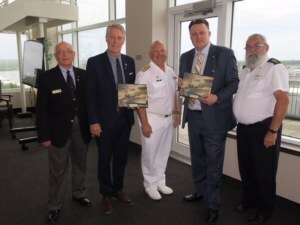 The City of Hamilton was represented by Mayor Fred Eisenberger, who brought greetings from his city to Halifax, and also a proposal to develop an association between the historic ships from Hamilton and Halifax: HMC Ships HAIDA and SACKVILLE. Mayor Mike Savage also attended the reception, and brought very encouraging words of support for SACKVILLE, now and into the future. He applauded the efforts of the many volunteers who have had the vision and perseverance to preserve SACKVILLE, “The Last Corvette.” Each of the mayors was presented with a mounted photo of Sackville by Wendall Brown, to mark the occasion. The overall theme is that both cities have a Royal Canadian Navy historic ship in their harbours. HMCS HAIDA was recently designated Canada’s naval flagship. She is owned and operated by Parks Canada. Here in Halifax, HMCS SACKVILLE has been designated as Canada’s Naval Memorial since 1985. By contrast SACKVILLE is owned and operated privately by the Canadian Naval Memorial Trust with support from the Navy. Currently she is “high and dry” for maintenance in the Dockyard and will miss this summer season on the waterfront. Hence, the AGM reception normally held on board is relocated to Stadacona. Just last summer, Mayor Savage “manned” SACKVILLE’s gangway for two hours greeting visitors. He is very familiar with the Trust and our usual waterfront operation.